"Q. You are skeptical of the way people protest through social media, of so-called 'armchair activism,' and say that the internet is dumbing us down with cheap entertainment. So would you say that the social networks are the new opium of the people? A. The question of identity has changed from being something you are born with to a task: you have to create your own community. But communities aren't created, and you either have one or you don't. What the social networks can create is a substitute. The difference between a community and a network is that you belong to a community, but a network belongs to you. You feel in control. You can add friends if you wish, you can delete them if you wish. You are in control of the important people to whom you relate. People feel a little better as a result, because loneliness, abandonment, is the great fear in our individualist age. But it's so easy to add or remove friends on the internet that people fail to learn the real social skills, which you need when you go to the street, when you go to your workplace, where you find lots of people who you need to enter into sensible interaction with. Pope Francis, who is a great man, gave his first interview after being elected to Eugenio Scalfari, an Italian journalist who is also a self-proclaimed atheist. It was a sign: real dialogue isn't about talking to people who believe the same things as you. Social media don't teach us to dialogue because it is so easy to avoid controversy… But most people use social media not to unite, not to open their horizons wider, but on the contrary, to cut themselves a comfort zone where the only sounds they hear are the echoes of their own voice, where the only things they see are the reflections of their own face. Social media are very useful, they provide pleasure, but they are a trap." "Indigenous video game culture creates a game space that Korean gamers use to construct their digital national identity. To Korean gamers, the concept of a digital Korea represents an imaginary space of Korean community where people play games together. Unlike gamers in the United States and Japan, whose gaming experience tends to be individualized, Korea's indigenous video game culture represents a new form of youth culture that allows young gamers to engage in social interaction through gaming with friends at PC Bangs. In this culture, entertainment happens at the moment when gamers are able to 'shout and play games together.' This experience of social gaming creates a particular taste of gameplay that also leads to further immersion in a gaming narrative particular to most Korean gamers (Ok 2011). It is said that Korea is a mad gaming nation (Ahonen and O'Reilly 2007), and the country has the highest penetration rate for a single online game; 12 million South Koreans have driven a car in the Nexon online game Crazyracing Kartrider (2004). In addition to social gameplay within the Korean community, nation-building sentiments also arise in the context of Korean player-killing, where Korean gamers engage in social gaming on the international servers of an online game. Thomas (2008) describes such gameplay as a cultural location that reflects existing racial tensions between Korean and American gamers. Similarly, political tension also appeared in a game massacre event, when Chinese gamers hacked into a Korean server and sparked mass killing between Chinese and Korean gamers in Legend of Mir II (2001). On a macro level, gaming as a national pastime can be seen in the rapid spread of e-sports in all aspects of Korean society, and this e-sport culture is an indigenous gaming culture that receives support from the government, media institutions, and passionate gamers. 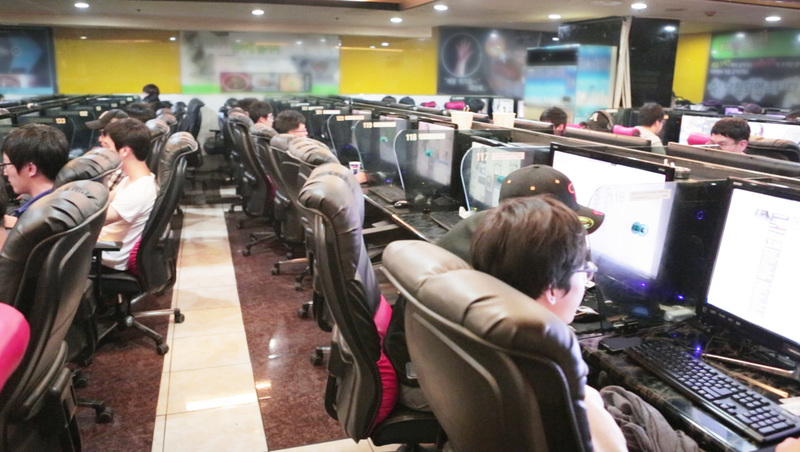 E-sports have become recognized as an international sports phenomenon with their origins in Korea. With their emphasis on professional gamers, they have also become an emerging new media phenomenon, an international spectacle in video games (Jin 2010)." Wolf, M. J. P. (2015). "Video Games Around the World", The MIT Press. In Couzin's research on locusts, for example, the insects form plagues that move together by just barely avoiding collisions. 'Recently, avoidance has also been shown to allow the humble fruit fly to make effective collective decisions,' he wrote. It doesn't look like Spot is programmed to work with his twin brothers and sisters–but that doesn't matter if their coordination emerges naturally from the physical rules that govern each individual robot. Clearly, bumping into each other isn't the safest or most efficient way to get your robot army to march in lock step, but it's a good start. And it's relatively easy to imagine several Spots working together in organized ways if the LIDAR sensors fitted on their 'heads' were programmed to create avoidance behaviors–like those locusts–rather than simply reacting to collisions. Spot's life–like motions are uncanny, but when you add this emergent, collective behavior–which can sometimes be unpredictable–the possibilities get downright scary. Will Spot's group dynamics stop at the point of swarming like locusts? (Ominous.) Will they cluster into self–protecting balls like sardines? (Less so.) Or could they end up as smart and responsive as humans? Couzin goes so far as to call this bump–and–grind between Spots One and Two a social interaction. 'No matter how primitive, there's no doubt that these interactions could enhance the decision–making capabilities of such robots when they must make their own, autonomous, decisions in an uncertain world,' he wrote. We'll just have to hope that decision–making involves not trampling us when a pack of Spots starts stampeding like wildebeest."